In an effort to improve the way compensation values are established, CSF-Brazil held a seminar for the public prosecutors of the Public Prosecutor’s Office responsible for legal claims by communities affected by infrastructure projects. We reviewed the concepts and criteria used in economic valuation to calculate social and environmental impact values, with main focus on the uses and limits of economic valuation for compensation claims. This seminar opened the field for debate about the potential uses and misuses of valuation methods for establishing compensation values in different contexts. 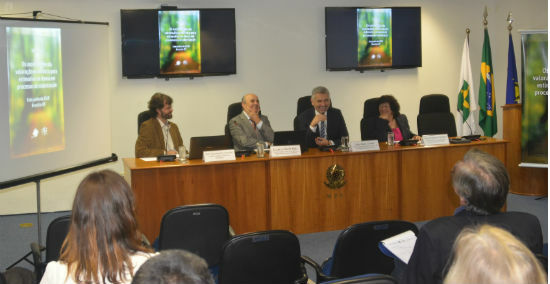 The event was held in partnership with the School of the Public Prosecutor’s Office (ESMPU), in Brasília, on June 8th , 2018, and hosted 25 public prosecutors and experts from the fields of anthropology, economics and forest engineering. Representatives from NGOs that work with communities affected by dams were also present. Panelists Pedro Gasparinetti, CSF-Brazil Director; Luciano Maia, Deputy General Prosecutor of the Republic and Representative of the 6th Coordination and Revision Chamber / Attorney General's Office (CCR/PGR); João Akira, Director of ESMPU and Darey Santana, Deputy Attorney General of the Republic and Representative of the 6th CCR/PGR. 1) Which criteria are used to define compensation values for social and environmental impacts? 2) In which contexts should economic valuation be used or avoided? 3) Which aspects are necessary for a valuation study to provide valid information? To answer these, we presented a broad set of economic and legal views on the potential uses and limits of economic valuation. In the morning session, we presented theoretical concepts, objectives, strengths and weaknesses of each valuation method. In the afternoon, we presented case studies for both successful and unsuccessful cases addressing compensation claims. The feedback from the event was very positive, and we are now working to design longer, more in-depth courses for the prosecutors, demonstrating the potential to disseminate tools for environmental and social impact analysis to help defend community rights. Our goal is to support the discussion about legal strategies to defend the local population's rights and the integrity of their territories in the face of threats from unsustainable exploitation of natural resources by Infrastructure projects. Click here to read the news about this event posted at the ESMPU's website (in Portuguese).